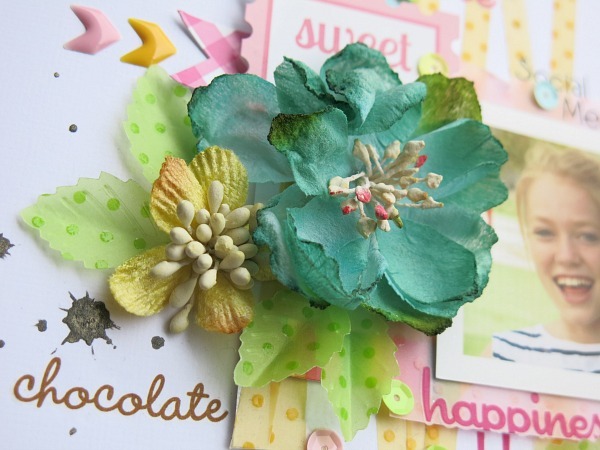 Doodlebug Design Inc Blog: Sprinkle it with Love - Vellum is back! It's Monday! Can you believe the weekend has been and gone and here we are at the beginning of a brand new week and the start of our SPRINKLES VELLUM Spectacular. For the next two weeks our design team are going to showcase different ways of using this super cute product and hopefully inspire you to renew your love of vellum as it makes a resurgence in popularity. 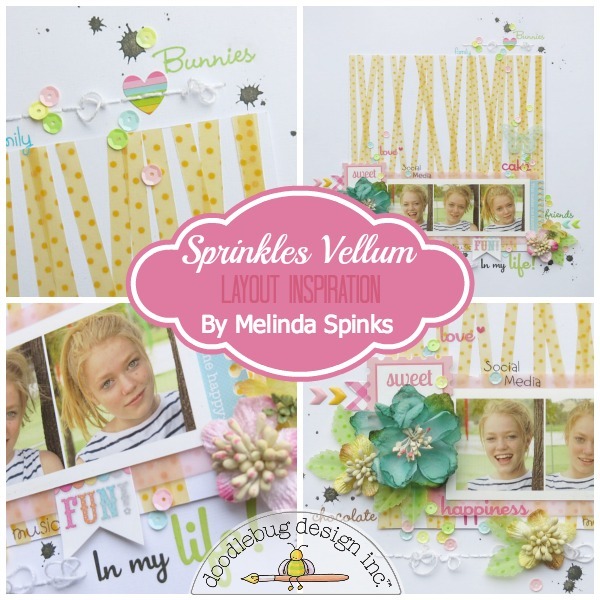 Hello everyone, it's Melinda with you today and I'm here to share a layout I created that will hopefully give you a few ideas on how to use the Sprinkles Vellum in multiple layers. Firstly I cut 5mm strips of the Bumblebee Vellum and layered them over each other to create a criss-cross background pattern. To adhere each strip I used a 3mm wide double sided tape which I am pleased to say doesn't show through as the Sprinkles vellum is slightly thicker than standard vellum and the colour and spots also help to hide adhesives. 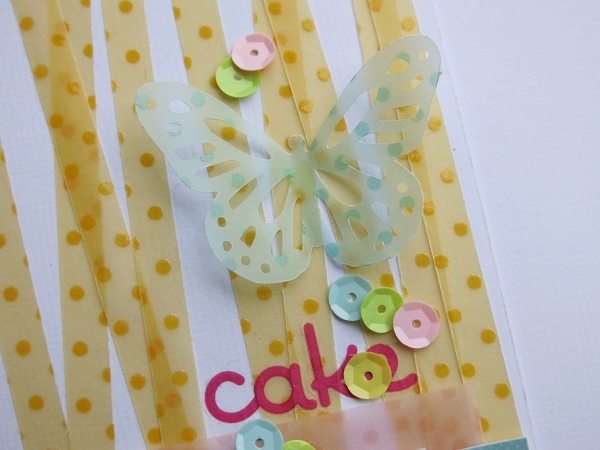 I also dragged out my old Martha Stewart butterfly punch to cut this sweet little shape using the Peacock Vellum. Now I would normally recommend punching your vellum with a piece of standard copy paper behind it so the punch doesn't chew your vellum. However the extra thickness of the Sprinkles vellum worked perfectly in the punch. You may need to use the extra piece of paper with finer detailed punches. And how lucky are we? Yes the Doodlebug Design team have been spoilt with a gorgeous selection of Petaloo flowers to play with. I must admit it has been quite some time since I've used flowers on a layout so after a slow start I realised just how much I've missed them. I decided to add a few vellum leaves (Limeade Sprinkles Vellum) behind the floral embellishments which I adhered using a simple white craft glue that dries relatively clear. I wasn't too concerned with how much I used as I knew the tacky ends would be hiding underneath the flowers. However, it really only took a small drop to stick those leaves in place. 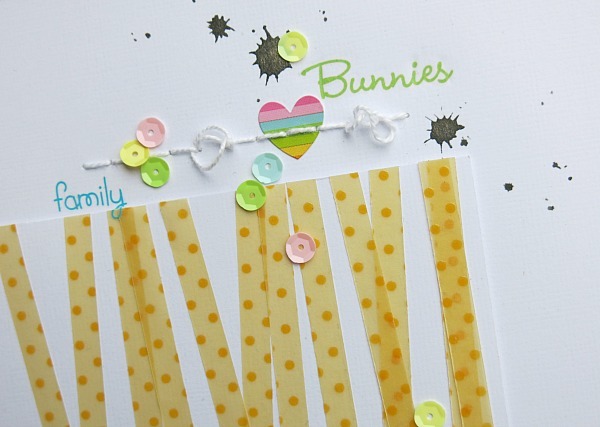 Don't forget to stop by tomorrow for more ideas on adding the Sprinkles Vellum to your craft projects. You definitely made vellum look cool...love it! You have worked magic with the vellum & sequins - LOVE IT ALL!!! I went further than simply looking at your lovely layout (like I often do) and wanted to see how you attached the vellum. Adhesive show through has been a problem and you gave a solution (hoping it works on vellum in my stash as well). You also answered my forgotten dilemma of punching vellum. Thanks for sharing your great layout and knowledge as well. 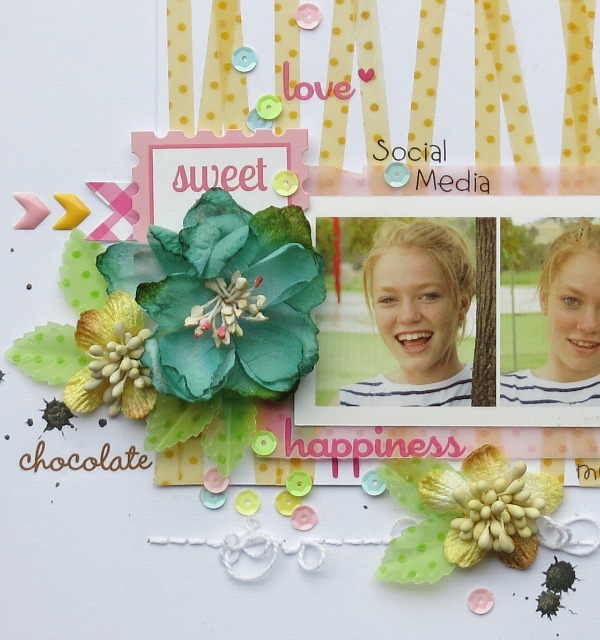 Pretty impressive the way you used vellum strips to create a cool, different, but really pretty background for this layout! !